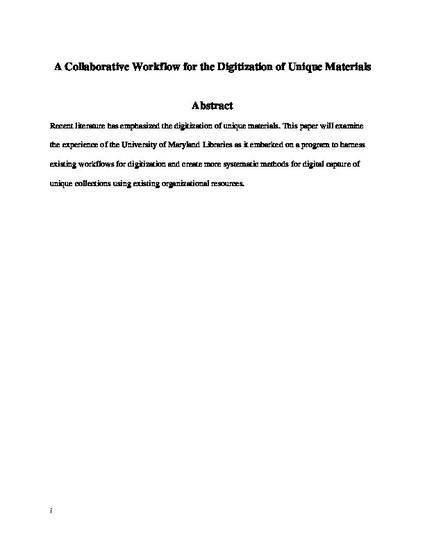 This paper examines the experience of one institution, the University of Maryland Libraries, as it made organizational efforts to harness existing workflows and to capture digitization done in the course of responding to patron requests. By examining the way this organization adjusted its existing workflows to put in place more systematic methods for digital capture of unique collections, the authors hope to provide insight into the benefits and pitfalls of one model for scaling up digitization. Accepted version. Journal of Academic Librarianship, Vol. 35, No. 5 (September 2009): 468–474. DOI. © 2009 Elsevier. Used with permission. NOTICE: this is the author’s version of a work that was accepted for publication in Journal of Academic Librarianship. Changes resulting from the publishing process, such as peer review, editing, corrections, structural formatting, and other quality control mechanisms may not be reflected in this document. Changes may have been made to this work since it was submitted for publication. A definitive version was subsequently published in Journal of Academic Librarianship, VOL 35, ISSUE 5, (September 2009) DOI.